Do you have any unfinished projects around your house? Can I tell you that I hate unfinished projects. When we bought our home it came with a random fire pit that looked like an unfinished project. How do you dress up a fire pit? It took me six months to figure it out but I finally did, so here we go; FIRE PIT WITH DIY PEA GRAVEL AND PAVERS. Before we dive into this outdoor DIY project, I want to show you our simple outdoor fire pit before we added anything around it. Doesn’t it look sad and lonely? Ok, I know it’s not a person, but it needed some help! At the same time I was contemplating the fate of this fire pit, we were also debating on what to do with our mess of a front yard. 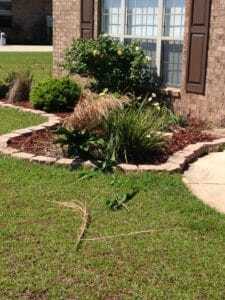 Below is what the front landscaping looked like when we bought the house. We decided it looked overgrown and not that great to begin with, so it was time to re landscape. That left us with a bunch of nice and expensive pavers that we didn’t know what to do with. I had thoughts about tearing the fire pit down because I just didn’t like the way it looked. Until, one day I had a thought. I could REPURPOSE those Pavers and use them for a new backyard project involving our lonely fire pit. So during my”AHA” moment I decided to place the pavers from the front yard around the fire pit, fill it in with pea gravel, and then add some chairs for seating! I really wanted an inviting area where we could to sit and roast s’mores, tell stories, (sing kumbaya! LOL) or whatever you do around a fire pit. This is where my outdoor fire pit makeover really begins. I thought about waiting on my hubby to help move the pavers, but being the impatient person that I am, I couldn’t wait. As soon as I put my 1 year old down for a nap, I raced outside to begin. And yes, I laid all those pavers in a circle around the fire pit all by myself. WOW, lets just say my back felt it for the next few days. As far as creating a perfect circle with those pavers, I didn’t do any fancy calculating like my husband the engineer would have done. I did measure the distance from the fire pit to the pavers to make sure it was even on all sides. Then I just kept moving them around until they looked good. After I created a circle with the pavers, I needed to decide what I wanted to fill the space with. As always, I needed a budget friendly solution. Ideally, we would have liked to lay concrete, but we decided for the mean time that pea gravel was quick, cheap and easy. So PEA GRAVEL it was. I have to admit, the kids were more excited about our new pea gravel filled fire pit than we were. I didn’t realize at the time how much it would resemble a sand box to them. We’re pleased with the way it turned out and have already enjoyed a few fires. With a little thought and effort, you can dress anything up, even a random outdoor fire pit! If you liked this post, please feel free to Pin it to Pinterest. Did y’all like this project? 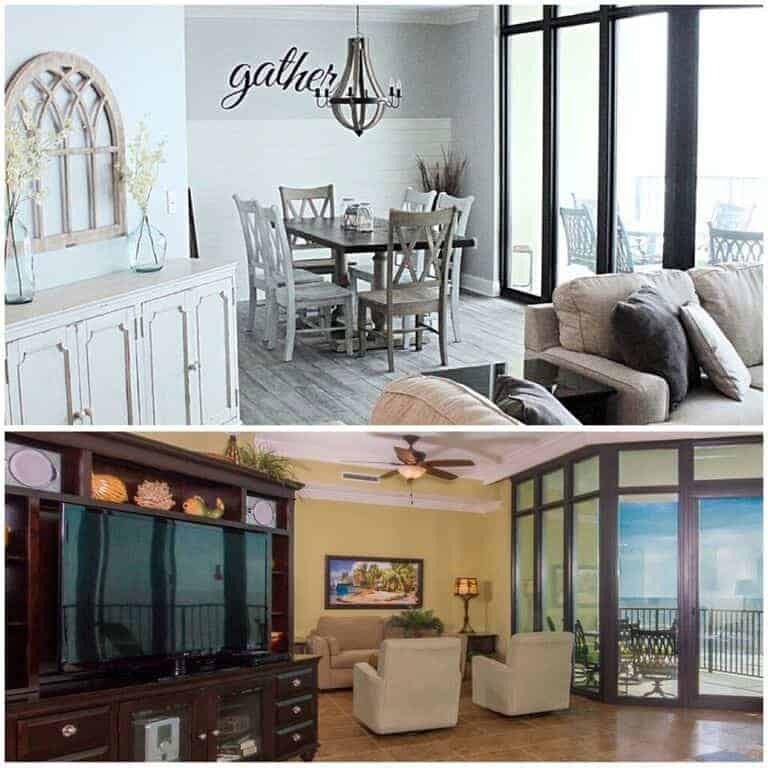 Want to see more easy and budget friendly home projects? Just click HERE. If you liked this project, you might enjoy my Industrial Pipe Sliding TV cover tutorial too! Oh my, you guys did a wonderful job. It turned out amazing. Thank you for sharing at The Really Crafty Link Party this week. Pinned! SO pretty! LOVE it. Thank you for sharing at the Creative Gallery. We’re so similar! I’m too impatient to wait for the husband to get things done. (That’s why I built our outdoor bar by myself…including placing the 7-ft pallet on top!) If it makes you feel any better, though, we placed landscaping fabric underneath some of our projects, and it didn’t really stop everything. We still need to spray for weeds and grass. Love the fire pit area. Looks like a fun place to spend summer evenings! Good to know that even the fabric doesn’t stop the weeds! we’ve kicked around the idea of laying concrete, but another day another project. Thanks for stopping by and have a great day! Looking GOOD! Well done girl! 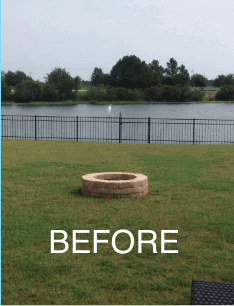 Thankfully you decided to keep the fire pit, this is a great before and after. Thank you for sharing with us this week at Celebrate Your Story, and have a great week. 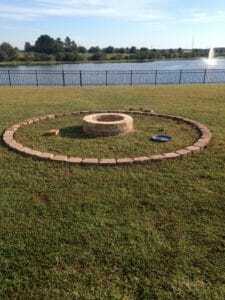 your fire pit area looks great we are busy at diy projects as well. It looks so much better, now! It looks like an inviting place for folks to gather for conversation and to enjoy a fire. The pavers around the outside look nice and also serve the purpose of keeping the pea gravel from scattering — brilliant! I love this project! I’m going to show my husband so we can do this in our yard! Thanks for sharing at the Family Joy Blog Link Party this week! Okay, I have MAJOR fire pit envy — GREAT job!! We have a little portable fire pit, but I may need to talk to my husband about installing a permanent pit like yours. Visiting from Inspire Me Wednesday! Come visit us sometime at MammaTech — we are always looking for guest bloggers (and we pay)! It looks great, and I love how you re-purposed stuff that was going to get thrown away otherwise. Awesome. Lindsey! This is such a great idea! I think I may have to convince my husband of doing this! It looks awesome…thanks for sharing!! I like how you just decided to tackle the job on your own while you had a chance! You are inspiring me to just go for it and just start in on our backyard project! Oh wow, it looks great! Fantastic DIY job you did, I am sure you enjoy sitting around the fire ona cool evening! Thanks so much for sharing at Celebrate Your Story! What a world of difference! You took an ugly duckling and made a swan! Just shared to your facebook group! Thanks for the invite and glad you like the Fire Pit. What a fabulous project! I am sure there will be plenty of fun occurring around your fire pit! Thank you so much for sharing your project with us over at Waste Not Wednesday! Pinned! Nice job, Lindsey–I’m with you, I hate unfinished projects. 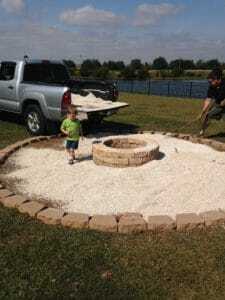 It’s so satisfying to see something through the end 🙂 Thanks for linking up your fire pit project with us at Vintage Charm! Lindsey you did a great job. And extra kudos for reusing your pavers so that they didn’t go to waste. I’d say your impromptu calculations are spot on! Pinning! 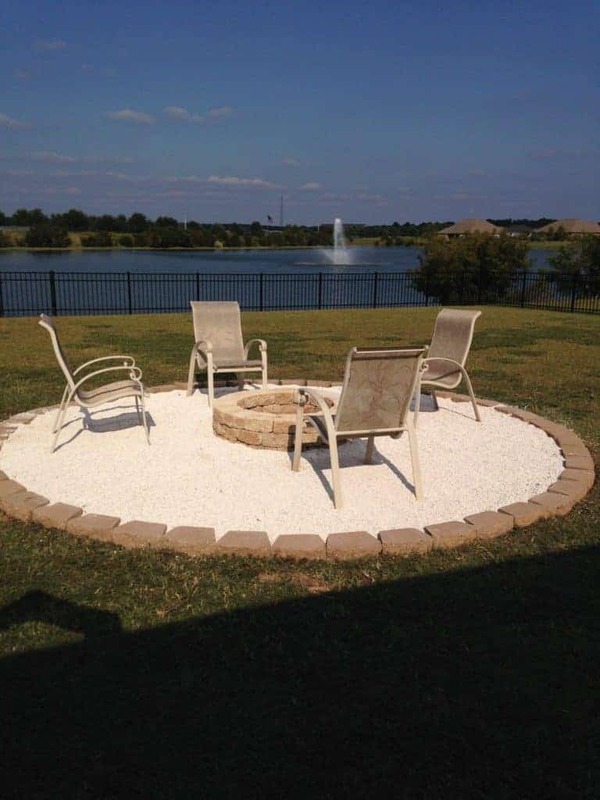 Your fire pit area looks wonderful! My husband is also an engineer and I can imagine how long he would take to measure precisely. I’m like you though-in a rush to get it done and finding shortcuts. You did a fantastic job! Thanks for sharing at Snickerdoodle. Pinning to my Outdoors Board. Thank you for the idea. 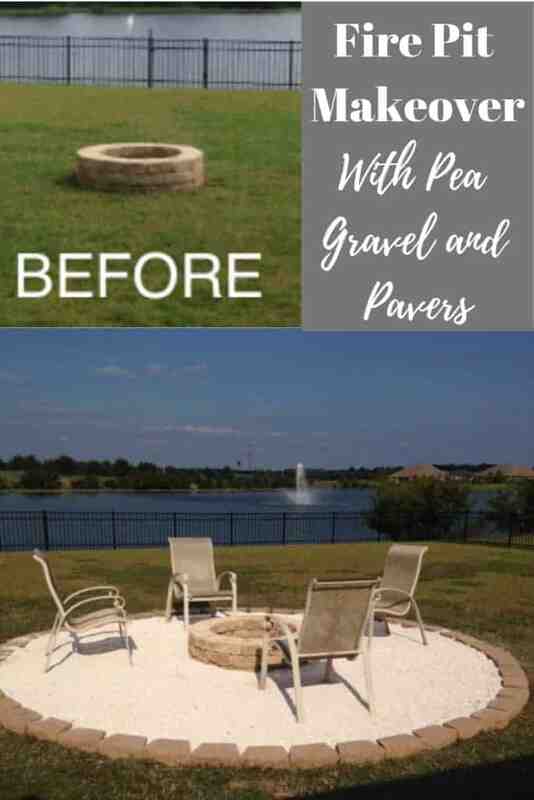 I have a huge yard and we were thinking to add a fire pit, too many ideas and too expensive, this is perfect we have the pavers already in the front yard and want to get rid of them an update the front yard, but you just make it easy for me with this beautiful idea. Thank you again. I’m so glad this post has inspired you! Thanks for stopping by. This looks great. What are the dimensions of your fire pit area and how much pea gravel did you end up using? I am currently planning a similar project? I believe we used about 10 Cubic Yards for the pea gravel. We purchased the pea gravel to fill the space for about $150. I wish I could give you dimensions, but unfortunately we just moved from this house a few months ago. I hope this helps and I’m sorry I don’t have more info.